The thrill of the skate. 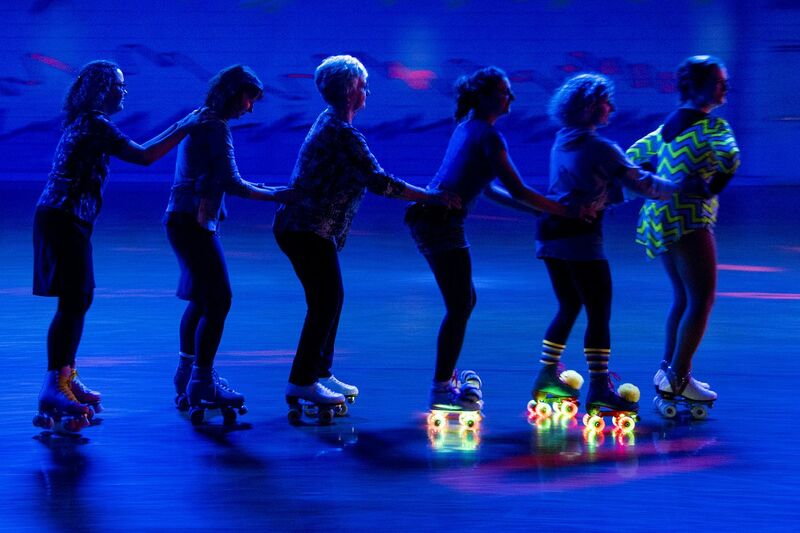 There’s a roller rink revival in Philly and beyond. Roller skaters of all ages, ethnicities, and economic backgrounds come together for fun at roller rinks across the nation as there is growing interest in the activity. In Delanco, skaters formed a line dance at the Holiday Skating Center where there is live organ music Tuesday nights. Floyd Williams, soon to be 82, has no plans to stop roller skating. Neither does one-time roller derby competitor Zia Hiltey, 34. The two, both of West Philadelphia, dance hand-in-hand when they cross paths on skates Tuesday night at the Holiday Skating & Fun Center in Delanco. They’re at the Burlington County rink for the live organ music played for the past 22 years by business executive Ralph Brown, and, most of all, for the thrill of the skate. On any given day in the Philadelphia region, home to at least 11 thriving roller rinks, children of all ages, their parents, and grandparents are lacing up and rolling onto hardwood floors for a perennial pastime that is back — again. The roller skating revival draws together folks of diverse ethnic, social, and economic backgrounds for hours of fun on wheels. Floyd Williams dances with Zia Hiltey at the Holiday Skating Center in Delanco where there is live organ music on Tuesday nights. Hiltey, a professional photographer, skated as a child and took an interest again in 2006 when she was lured by the punk aspect of roller derby. She competed with the Philly Roller Girls for two years and now skates just for fun. Since the debut of roller rinks in the United States in the early 1900s (Chicago opened one in 1902 and it attracted more than 7,000 people its first day), roller skating has held a singular place in American culture from urban centers to the suburbs. Jim McMahon, executive director of the Roller Skating Association International, said the renewed interest started several years ago on the West Coast, where California’s temperate climate provides a welcome backdrop. The revival has since moved to the East Coast, where rinks are seeing an uptick in customers. Although the number of rinks in the United States has fallen from about 1,260 five years ago to 1,200 today, more people are skating, McMahon said. In 2017, 36 million skaters went to a rink. Last year, it climbed to 38 million, and the industry expects that number to rise to 44 million in 2019. Rink owners are now partnering with educators through STEM programs, in which students learn the science behind roller skating. They study physics, rink design, and the art of combining music with skating. Then they put it all together in the rink. The older generation of skaters, those in their 70s and up, say they worry that the art of roller figure skating — holding hands, skating in unison, spinning — is slowly disappearing. They say it’s a style that many younger skaters don’t embrace. The year was 1951 when White spotted his beloved Dottie, “a hell of a skater,” at a rink at Broad and Poplar that closed years ago. Although his wife died 10 years ago, White, who has had two knee replacements, keeps skating. He visits the Palace rink in Northeast Philly where there’s a much younger crowd and modern music. He prefers Holiday, where Ralph Brown plays the organ every Tuesday night. Since 1996, Brown, who lives in Reading, has driven 90 minutes each way for the Delanco gig. He also plays at a rink close to his home. He has been playing at roller rinks for 53 years, he said. On a recent night as dozens of skaters arrived at Holiday, Brown climbed into the booth and took a seat behind the Hammond organ. His fingers danced across the keyboards as he bounced a knee to songs like the “Chicken Dance” and “You Should Be Dancing” by the Bee Gees. “Couples only,” Brown announced before he played “I Will Always Love You,” followed by “Love Story.” He flipped the lights off and the rink fell dark but for the kaleidoscope of colors from a hanging disco ball and the red-and-green lights blinking above the snack bar and skate-rental desk. Vivian Veith-Ackroyd, 84, has been a manager at Holiday since 1972. She remembers when skating was so popular that customers were turned away after the first 1,200 skaters arrived. “We would have a line out the door and down the road,” Veith-Ackroyd recalled, the disco lights reflecting off her gray hair. “It was crazy. It’s not like that now.” Now, a good night is when several hundred skaters show up. Kadeem Vaughn, manager of ISC Cherry Hill, has noticed the renewed interest in skating at that rink. It’s “magical” for kids and awakens the inner child of parents who return to skate nights, or rent the rink for adult ’80s-themed parties. “They go back to a happier time," Vaughn said. Janet Jordan of Voorhees, a retired assistant Camden County prosecutor, is a national champion figure skater who no longer competes. She judges competitions across the United States and teaches roller skating in Cherry Hill and Perth Amboy. She has no plans to give up skating, which she started as a young girl. Skating instructor Janet Jordan teaches 5-year-old Allie Eickmeyer of Marlton how to jump during a session at ISC Cherry Hill. Caren Eickmeyer of Marlton brought her 5-year-old daughter, Allie, for a morning class with Jordan the other day in Cherry Hill. After the class, Eickmeyer pulled on a pair of rentals to join her daughter in the rink. “It brings you back to your childhood ... all those Friday nights skating,” said Eickmeyer, adding that the 1980 musical roller-rink love story Xanadu was among her favorite movies. Out on the floor, champion skaters who dazzle with fancy footwork join amateurs working to master simpler moves. In the world of skating, different regions are known for different styles. Philadelphia and South Jersey are known for skating backward; New York and North Jersey favor chain skating. Roller skating does not attract the same recognition as ice skating, an Olympic sport. But several skaters pointed out that Olympic gold medal ice skater Tara Lipinski, a Philly native, got her start on roller skates, and her first big wins were on wheels, not blades, when she was 8 and 9 years old. With skating’s popularity on the rise, rinks across the region have gotten creative, hosting birthday parties, gospel nights, and adult skating after 10 p.m. The Millennium Skate World rink in Camden is hosting a fund-raiser for the Cramer School. The rink's manager is Tracy Medley. Tracy Medley, the managing partner of the Millennium Skate World in Camden, said roller rinks cater to a diverse crowd with varied interests, but have one common denominator: fun. “All walks of life come together as one,” said Medley, who started skating as a child and later turned her Stockton University business degree and passion for skating into a career when the rink opened nearly 20 years ago. “It was my dream." On a busy skate night when hundreds crowd the Millennium floor — where rapper Meek Mill, on skates, filmed his “Monster” video in 2015 — Medley recognizes the regulars. There are doctors, lawyers, teens.